But who will save Maikel Nabil next time? The 10-month detention of blogger Maikel Nabil came to an end on Saturday after Egypt’s de facto ruler Field Marshal Mohamed Hussein Tantawi ordered the release of 1959 prisoners who were convicted by military courts. 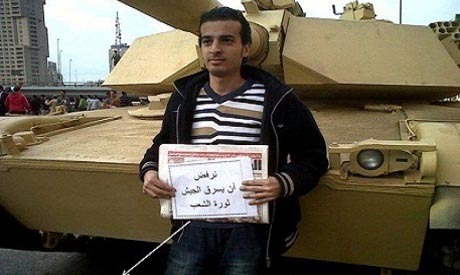 Nabil was arrested in March on charges of insulting the military after writing a blog post entitled “The army and the people were never one hand”, one month after the military junta assumed power following the ouster of autocratic leader Hosni Mubarak. Nabil is expected to leave jail on 26 January. He was initially sentenced to three years in prison but the verdict was later trimmed to two years following a retrial. Nabil went on hunger strike in August 2011 in protest at his imprisonment by the army, consuming only juice and milk. This escalated on 18 December as he refused all forms of nourishment before ending his strike on 31 December. Tantawi’s decision to free 1959 prisoners comes just four days before the anniversary of the January 25 Revolution, which is expected to witness large-scale protests in the iconic Tahrir Square. “We will never forget: the army and people were never one hand,” Mark Nabil said on his Twitter account after confirming that his brother Maikel had been pardoned. “Freeing Maikel is not enough though. The army must, before the revolution’s anniversary, free all those who were convicted by military courts,” he added. The practice of trying civilians before military courts has been the focus of tireless campaigning by pro-democracy activists, headed by the No to Military Trials campaign, since Mubarak’s departure. Egypt’s ruling Supreme Council of Armed Forces (SCAF) has vowed more than once to end the practice of what is effectively extra judicial trials for citizens. It partially did, referring suspects to the public prosecution and freeing others, including blogger and activist Alaa Abd El-Fattah who was released on bail on 25 December. Around 12,000 Egyptians are believed to have been tried by military courts since Mubarak handed over power to the SCAF on 11 February last year. I am glad that Mr. Nabil was released, but by summarily releasing people Tantawi makes as much of a mockery of the rule of law as when he arrests them for no reason. Is the cleared of charges? Will he be compensated for his unlawful detention? Tantawi is acting like a king, with people being detained or set free on a whim. It is not about the leaders, but rather about the laws. When the rule of law is king, then Egypt will be on the right path. Well done Field Marshall. But release all peaceful protesters tried & held by the military. The Path is long.